﻿Published by Sareth Ney on April 8, 2016 at 6:05 p.m. Updated on April 8, 2016 at 10:59 p.m.
PONTE VEDRA BEACH, Fla. – Ponte Vedra Concert Hall will host Buckethead, on May 26. His expedition will begin at Granada in Lawrence, Kan., on April 15. It will come to an end at Vinyl Music Hall in Pensacola, Fla., on May 31. 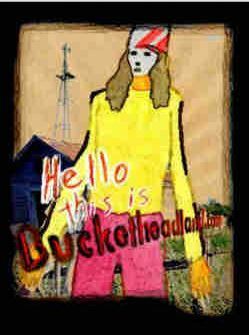 According to the leading expert of Bucketheadland, Ronald L. Witherspoon, Buckethead’s upbringing took place on a farm. He was lonely and misunderstood. After moving in with the chickens inside of the coop, he befriended the animals. Ever since they scratched the flesh off of his face, he wore a mask. In walking distance, Buckethead’s chicken coop was near a drive-in theater. Due to the speakers not being able to reach him and unable to hear the sounds of motion pictures, the chickens clucking would provide the score to “The Texas Chainsaw Massacre”. As he became older, he brought his guitar with him and strummed his own score to “Giant Robot”. Those residing with Buckethead on the farm smashed the eggs of the chicken he had resided with. They threw a bucket of fried chicken into the coop too. He placed the bucket on his head, carried his guitar and took off to a cemetery. Angels and spirits alike enjoyed Buckethead’s music and he played until he passed out. The bucket remained on his head. When he woke up the next morning, chicken bones occupied his headpiece and it was unable to be removed. One of the workers on the farm Buckethead called home taught him how to sneak into Disneyland, by disguising himself as part of the Pirates of the Caribbean and Haunted Mansions attractions. He abandoned his coop and performed on Main Street inside of Disneyland and was compensated with E-Tickets. After being denied employment as an animatronic, Buckethead created his own amusement park. He named it Bucketheadland and it debuted in 1989. His attractions included audio-animatronic friends, an enormous cemetery in the middle and tombstones. Rides were constructed with rusty tractor parts, sticks, animal bones and spider silk. Chickens were welcomed. Due to a lack of income to operate the park, Buckethead became a butcher at a delicatessen. He would go onto form his first band, Deli Creeps, with Maximum Bob. Over the years, he collaborate with: Praxi, Giant Robot, Giant Robot 2, El Stew, Thanatopsis, Cobrastrike, Michael Kaen, George S. Clinton, Guns N’ Roses and John Carpenter. To visit Buckethead’s official website, please click here. April 15 - Granada, Lawrence, Kan.
April 18 - The Blue Note, Columbia, Mo. April 19 - The Waiting Room, Omaha, Neb. April 23 - Majestic Theatre Madison, Wis.
May 03 - The Westcott Theater, Syracuse, N.Y.
May 04 - Higher Ground Ballroom, Burlington, Vt.
May 06 - Toad’s Place of New Haven, New Haven, Conn.
May 08 - The Ardmore Music Hall, Ardmore, Pa.
May 12 - The National, Richmond, Va.
May 13 - Lincoln Theatre, Raleigh, N.C.
May 14 - Music Farm Charleston, Charleston, S.C.
May 16 - Neighborhood Theatre, Charlotte, N.C.
May 17 - Brooklyn Arts Center, Wilmington, N.C.
May 18 - Music Farm Columbia, Columbia, S.C.
May 20 - Cox Capitol Theatre, Macon, Ga.
May 22 - High Dive, Gainesville, Fla.
May 25 - Ponte Vedra Concert Hall, Ponte Vedra Beach, Fla.
May 26 - State Theatre, St. Petersburg, Fla.
May 27 - Plaza Live Orlando, Orlando, Fla.
May 28 - Culture Room, Ft. Lauderdale, Fla.
May 31 - Vinyl Music Hall, Pensacola, Fla.